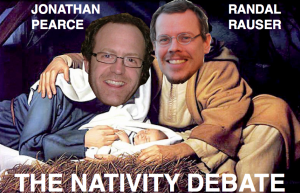 Jonathan Pearce debated Randal Rauser who co-wrote God or Godless? with me. They debated the historicity of the birth narratives found the gospels. The format was a 20 minute opening, 15 minute rebuttals, and so on. To the left is the amusing picture that Justin Schieber did at Reasonable Doubts, who hosted it. The link to the debate is right here! Jonathan writes at Skeptic Ink Network and wrote a good book on this topic: The Nativity: A Critical Examination.